If you’re looking for an additional way to earn extra cash on the side, completing online surveys is one of the most popular tried-and-tested methods. You do not need any experience, and you also don’t need any money to start. Plus it’s fun! Before you can start transferring cash into your bank account, however, you’ll need to find online surveys to complete in exchange for cash, and Survey Junkie is the best company we’ve found in 2018 that does precisely this. 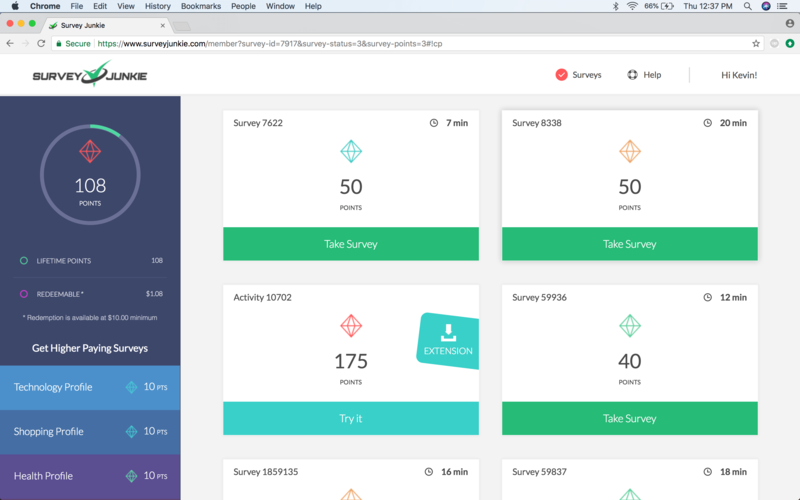 Survey Junkie is an easy-to-use site that finds all of the most valuable and interesting online surveys floating around the internet from various companies and aggregates them in a user-friendly layout in your account. With Survey Junkie, you take surveys and you get paid in cash. It’s that simple. One of the things we like most about Survey Junkie is that each survey is clearly marked with the amount of time it will take to complete, as well as how many points you will receive upon completion. One point equals one dollar, and just by completing the three low-priced surveys available in the screenshot below, you could make $3.15 in 39 minutes. Note, there are MANY more surveys available that pay $10+, and take less than an hour to complete. The actual time it takes to complete these surveys might be considerably less for you, as these times are just averages from Survey Junkie’s 3,000,000+ users. Main dashboard view. You’ll get $1.08 just for signing up. Overall, we review Survey Junkie a solid 5/5 stars. Unlike other forms of making money online, like investing and trading, there is ZERO chance of loss with completing online surveys, and Survey Junkie is the furthest thing from a shady online company promising to make you into a millionaire overnight. Moreover, out of all of they online survey companies, Survey Junkie is the highest paying and is definitely the easiest to use from both a computer and a smartphone. In terms of signing up and making your first dollar, it takes about thirty seconds and no identity verification is required. You can start completing surveys for cash immediately after you sign up. Once you meet the minimum payout level of $10.00, you will be eligible for payment via a deposit into your PayPal account, or an e-Giftcard to a popular online store. Yes. Bottom line, you’ll get paid, on time, every time. We never experienced any issues with surveys timing out, crashing, or not giving us points. 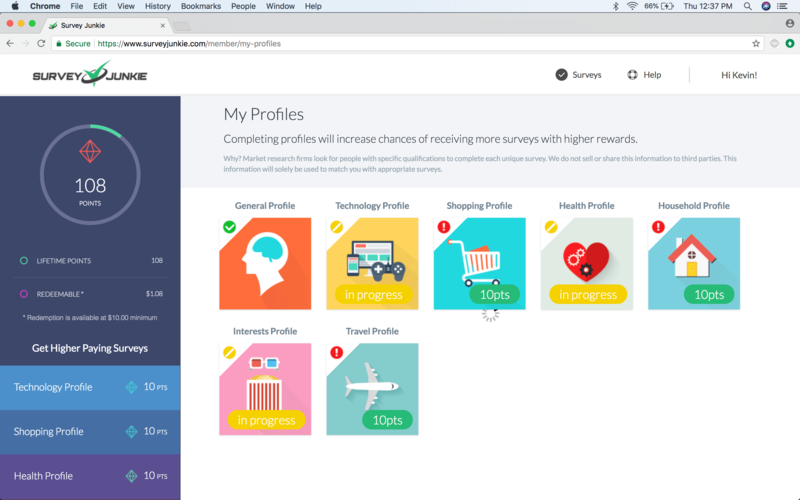 The online platform is very easy to use, and Survey Junkie has paid out millions of dollars to all of its active users. As survey Junkie clearly states on their website, you will not get rich by taking surveys. Unless you spent every living minute of your remaining life completing surveys, but this is unrealistic. Essentially, taking surveys online is a quick and easy way to generate additional cash every month, but it’s not going to make you millions of dollars. With that said, the more you fill out your profile, the greater your odds of being eligible for higher-paying surveys. This makes sense, because the feedback you provide on your surveys actually help companies make better products and services. The more information these companies have about the people completing their surveys and testing their products, the better they analyze the data. Plus, if a dog food company wants to get feedback on a new product, it helps to know that the people taking surveys hav an interest in pets. This is another great aspect of Survey Junkie, because you can complete surveys based on your interests, and some of them are really fun an exciting. At the end of the day, our Survey Junkie review is based on the overall ease of use and simplicity of Survey Junkie. Bottom line, it is simply the best online survey company out there. It’s simple, fast, safe, and decently lucrative. Moreover, there is no location requirement, so whether you’re sitting at home, listening to lectures in class, or even flying on a plane with WiFi, there are no excuses for not earning extra money by completing fun surveys. It’s also cool to know that your feedback is valued and will ultimately help companies make better, more efficient products.